Carlie Trent, 9, was signed out of her Rogersville, Tenn., school during the afternoon hours on May 4 by her uncle, Gary Simpson, 57, who has no current custodial rights to Carlie. 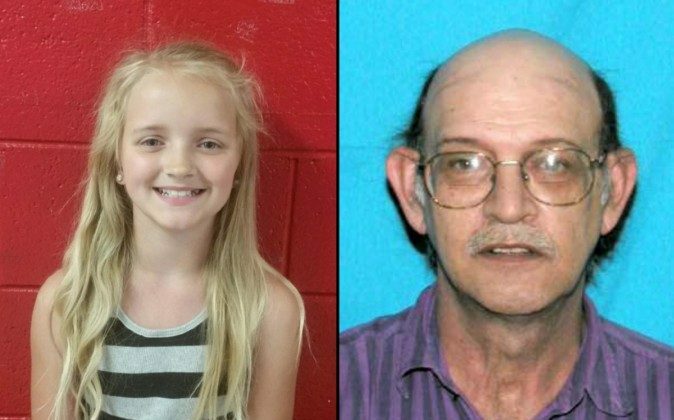 An Amber Alert was issued the following morning and remains in effect, according to the Tennessee Bureau of Investigation (TBI) and the Rogersville Police Department. “We will not rest at TBI until we bring resolution to this, until we find her and reunite her with her family,” said Josh DeVine, public information officer for TBI. As of May 9, DeVine says the bureau has received 150 tips, yet none included credible sightings of either, or the van they’re believed to be traveled in. “We have no specific evidence that she left the state of Tennessee, but we have not specific evidence that she is in the state of Tennessee, we honestly just don’t know,” DeVine said. He confirmed that authorities are searching on the ground and in the air, hoping more credible information will point them in the right direction. DeVine also confirmed Simpson used to have custodial rights to Carlie and her sister. “We want this guy in custody, we want Carlie Trent back home, we have no reason to believe that this was necessarily an innocent weekend trip,” said DeVine. Carlie is 4 foot 8 inches tall, weighs 75 lbs with blonde hair and blue eyes, and was last seen wearing a black and grey tank top and blue jeans. Simpson is a white male, 5 foot 10 inches tall, weighing 157 lbs. He is balding, has brown hair and eyes, and was last seen wearing a brown cap, a dark colored shirt and jeans. They’re believed to be traveling in a white 2002 Dodge Conversion Van with Tennessee registration plates 173-GPS. The van has a dark stripe along the middle with light gold running boards and paint is chipping off of the hood. Warrants have been issued for Simpson for kidnapping. On May 6, the U.S. Marshal’s Service indicated it was offering $2,500 in reward money for information leading to the child and the capture of Gary Simpson. On May 7, Carlie’s pediatrician, Dr. Chris Calendine, pledged to offer a $10,000 reward for information leading to the safe recovery of the child. Shortly after her pediatrician’s pledge, the TBI obtained footage of who they believe is Carlie and Simpson inside a Rogersville Save-A-Lot grocery store on the day she was picked up from school. “A thousand different thoughts at one time, you know, of why. Why he would have done this? Why he took her? Why? I don’t know. I don’t know. And if he’s sick enough to lie and take her, what else could he do,” Trent said. Gary Simpson’s wife, Linda, said the couple had custody of Carlie and her younger sister once before, saying they still take care of the girls every day. If anyone has information that may prove helpful, they may contact the TBI at 1-800-TBI-FIND.